The most beautiful campus among all at Infosys has 9 food courts and tell you what; you will get the best of everything that you can possibly think of at any company canteen. 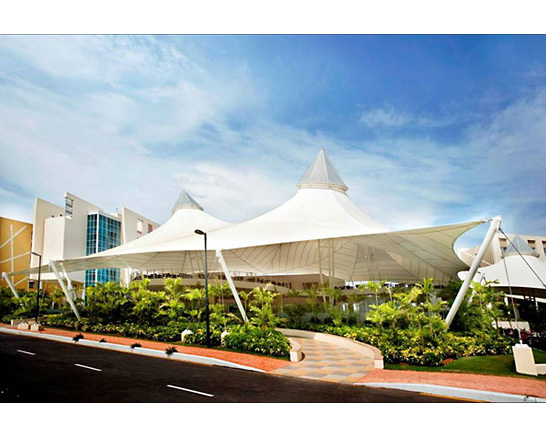 So let’s take a brief look at each of these Food Courts and let me tell you about what you should not miss at the heavenly campus of Infosys, Mysore. Let me take you from Gate 2 (the entrance). Fiesta – The two-floor Food Court is a favourite hang out zone for both the trainees and employees. The ground floor mainly deals with South Indian and North Indian meals. I was no fan of the servings. But if you are veg, you might try out the meals. Some of my friends liked it. It has a juice junction and it is the only place in the campus where you get sugar cane juice. Try out and I am sure you will love it. I was more impressed with the first floor servings that had kiosks that include Dominos, Polar Bear, Khasta Khanna, and Idlys. Dominos Pizza is a rage for whoever goes there and don’t forget to tell them that you want your order from Infosys Menu. Khasta Khanna, one of my favourite, provides good Chinese combos which include Chowmien, Chilly Chicken, Chicken Manchurian, Fried Rice, among many others. Polar Bear is more of an ice cream parlour and you should never miss the ‘Death By Chocolate’ ice-cream. It’s the best in the campus and costs less than 140 bucks. Idlys are more about idlis, vadas, sambar, dosas; priced low and tastes good. Multiplex Food Zone (also known as MFC) – This food court is operational 24X7 to cater to the hunger of employees working late night and also to trainees who prefer studying late at night fearing failure in tests. Dilli Darbar is one vendor that is quite famous and the food is good too. Long queues after movies on Saturday and Sunday night shows are normal. In the evenings, try out Panipuris, Samosa Chats and Dahi Bhallas here. They are good. This is another favourite hang out zones for the folks and you will always find it filled with guys chit-chatting away. Baskin and Robbins is an ice cream kiosk which one should never miss out on. Having ice creams with friends and chatting away, sure you don’t want to miss it. You can also have cakes and samosas from Aroma bakery. If it’s your friend’s birthday and you want to have a cake cutting ceremony, don’t forget to order for a cake here. The other kiosks include Dosa Delight, Juice Junction. You will also find an American Sweet Corn mini-kiosk here. Oasis (near block 79) – Situated in the midst of Boys’ and Girls’ hostels, this ranks No.1 in my list. The simple reason is it’s more of a Bengali food court. So if you are a Bengali, missing Kolkata or home-made foods, make it your den. For others, it is one place where you get practically everything. It’s a one stop place for all your stomach-needs. It is a two floor Food Court and in the ground floor you can have meals, veg, non-veg combos (both North Indian and South Indian). Don’t miss the Chicken Biriyani here! Other kiosks include Café Coffee Day, Aroma Bakery. There used to be a sugar cane juice centre here but it’s no more functional now. There’s a Convenio Store also where you get everything (food) from breads to biscuits, Cadburys to ice creams. So, if you have a girl friend, beware (joking)!!! Moving on to the first floor; there’s a kiosk that provide only combos and it gets crowded after 8:30 in the evening. It attracts large crowd because the food is not spicy. There’s a Juice Junction where you can have fruit salads, sandwiches, juices, milkshakes with ice-creams. There’s Fusion Bistro that you will admire if you are a fan of Chinese Food. Try out the Chicken 65 here, at times the preparation is just awesome. This is the perfect place where you can celebrate your friends’ birthdays at the dead of night!!! Channa Bhatura is available on both the floors. That’s all for now. Join me in the second part for more on food at the Mysore campus. Hey Swayam, you are about to enter the daddy of all workplaces !!! Hi !! I am a bodybuilder and i need to eat clean food such as veggies and chicken breasts. Where can i get that? Hi Deb, you get veggies everywhere. There are host of veg dishes that are available in each of the food courts. I am not sure if there are chicken breasts available within the DC but there should be tandoor kiosks. But would that help your cause? Thanks for getting back to me. Tandoor kiosks sound fine but then I wouldn't want to go high on my calories. Boiled chicken or just simple boiled veggies should be amazing! Or maybe even salad. Boiled chicken or veggies may not be readily available but salads of course are available. However I would not be able to say which vendor or food court they would be available in. I definitely will mate, I definitely will!! My doj is 21st September. Just another month to go. I'm a little nervous about passing the training to be frank but hopefully I'll get through this training. Dont worry, be mentally prepared to work hard and you will clear easily. Tumi parbe! Did you find a place where they serve boiled chicken? If yes, please tell.